Nilaveli beach is one which resembles the pearl of the East coast of Sri Lanka. Just 10 KM away from the main city of Trincomalee, lies the beautiful beach of Nilaveli. The long stretch of the bluest beach is the closest to Maldives. Visitors from various countries best express their heartfelt moments by returning during seasons. The beach comprise of the white coral sandy beach where anyone could relax and enjoy the moment to yourself. It was also noted that during the Second World War, Duke of Wellington and his associate paid a visit to the beaches due to an attack by the Japanese soldiers. 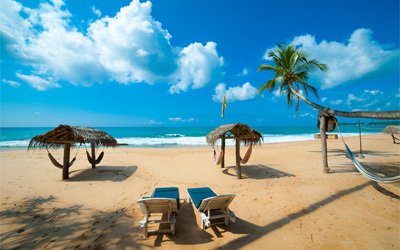 Prepare to enjoy the perfect beach vacation in Sri Lanka with total amusement throughout. Embrace the unique feeling of a simple getaway to a place so serene, exquisite, and remote yet paradise like throughout. Witness the transformation of the reality into a heavenly atmosphere. Capture and experience the beautiful and colorful hard and soft corals from the depth of the sea and add some to your own collection. Summer season – During the summer season from May to October very year the sea around Nilaveli acts very calm and considered fabulous and ideal for water sports. The beaches would be crowded and everyone engages in water sports during this season. Winter season – During the Winter season from November to April every year would be ideal for those who seek to experience a less crowded beach. Enjoy the beach all by yourself. It’s during this season that the sea gets a little rough than other days of the year. It’s with our experience that we assure your stay in Nilaveli gets interesting and exciting by the day. Just as much as you feel relaxed, you’d be tempted to involve in many excursion options at Nilaveli. Nilaveli Beach – one couldn’t possibly imagine about the excitement by their first step in the beach. Nilaveli which means “Blue water Sand” is the perfect get a way during this vacation. Enjoy the long undistracted stretch of lovely and breathtaking Nilaveli beach which lets you embrace it all over and relax absorbing the peace in mind naturally. Sit back and relax at the beach, or meander down the beach front with a never ending stretch letting you immerse in thoughts and get drifted away from the rest of the world. Snorkeling and Diving – Beach and water sport lovers consider Nilaveli as their paradise of dreams. Make your wish come true by taking part in your favorite sports. Snorkeling is one incredible water sport that improves blood circulation in body and let your feel energized. Witness the magnificent coral reefs as you snorkel deep down the beautiful sea. The beach consist of many diving instructors for guidance which includes a base leader, course manager, certified instructors and dive masters with various lingual skills. Boat Riding – On your request, you will be handed over to a team of experienced boat riders for a boat trip around the sea. Prepare yourselves with the readily available fishing rods and your lenses to capture these unforgettable and heartfelt moments at Nilaveli. Pigeon Island – One of the most heartfelt attractions in Nilaveli could be considered as the “Pigeon Island”. You will be taken to the Island in a boat where you can enjoy an awesome ride as well as capture your favorite moments. The natural island is incredibly beautiful and let you see amazing corals, eye catching birds, various blue water fish and sometimes giant turtles. Around the Island would be the ideal place for snorkeling lovers. The Island is just 2 km away from the shore of Nilaveli and identified as one of the best place of interest on the Island. Water sports and beach games – Nilaveli is one great beach one couldn’t resist enjoying. Kids wouldn’t dream of a place better for their vacation too. Water skiing, canoeing, banana boat riding, jet skiing, hobby cat sailing and jet scooters are a variety of water sports you can enjoy while beach volleyball and many other beach games invite you to enjoy on the shore. Let this vacation serve you with everything relaxing and entertaining throughout. Apart from excursions around the Nilaveli beach, there are other local excursions and places of interest for visitors. The Swami Rock Temple – Visit the famous Hindu temple in fort, Trincomalee with many followers and worshipers from around the world. The temple which is rich in Hindu culture and pilgrimage is one great stop for foreigners. Whale and dolphin watching – Any foreigner who’s here for the vacation during the period of May to September would be lucky enough to witness Dolphins and Whales in the harbor of Trincomalee. You will be taken in the boat for Dolphin and Whale seeing. Marble beach – The magnificent beach possess unmatched beauty not many knows. Let this vacation be the one to expose you to this exquisite and charming Marble beach letting you embrace its magnificence all on your own. The very scenic view of a group of small Islands from the shore is absolutely stunning. Relax on the shore of the Marble beach where the jungle touches the ends of the shore giving you more time to immerse in your thoughts. Lying in the bay of Trincomalee is not too far from the Beach of Nilaveli. Capture the unseen while enjoying to a most. Minneriya and Kaudulla national parks – Just 1 hour distance away from Nilaveli, the reserves of Minneriya and Kaudulla national parks play a vital role in the field of tourism. One could enjoy the sight of elephants and other animals resting on the banks of the Lake. During the seasons, the largest herds of Asian elephants are spotted in these reserves. Make the most of this vacation while at Nilaveli. Feel the difference by letting us arrange you a perfect vacation plan.